Fox Parlor - It’s a Wrap! Years ago, when I ran a boutique person design firm in San Francisco, the team got the what I thought was fairly simple idea of designing and printing wrapping paper as part of a holiday gift kit for clients. Well, the designing part was easy and fun— a great team effort, with great results. The printing part, less so. Anyway, so when I started looking for wrapping paper (other than my own) to carry in the store, I quickly found out that I wasn’t alone — there is not an overwhelming amount of it on etsy. Rather, I think this is an occasion to use the word underwhelming when describing my options. I did come across amazing Smock Papers (more about them in a later post) but I also did come across a really great wrapping paper–great design, beautiful color & high quality — in 51greenwichs’s shop. When I went to read the profile and policies (as always to find out who this person is who makes the stuff, and whether I would want to buy from them, and whether they will sell wholesale to me )— I ended up laughing out loud as I read her description of the process ((or ordeal might be a better word) she had to go through to get those printed. Here was a fellow traveler! Who didn’t give up! When I reached out I was so thrilled that she was happy to work with me on getting her wrapping papers into my store, and imagine my happy surprise when I discovered that she had a whole set of different colors, even more beautiful than what was listed on her etys site at the time. 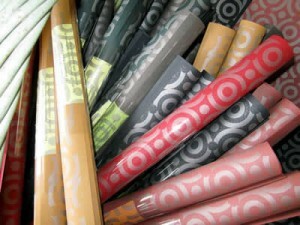 I love these papers, they are of a great qualty, wrap beautifully and really stand out. I just used it to wrap a gift, bought by the groom’s sister, for a couple who got married in our town! And I am really proud to carry 51greenwich paper products in my store.